We facilitated ABC LD workshops in UCL, Glasgow, Aarhus (Denmark), Bruges/Kortrijk (Belgium), Santiago (Chile) and Brisbane (Australia). We presented at two conferences and published a paper about ABC LD. Colleagues from other universities also facilitated ABC LD workshops (with our guidance). A full list of activities (with nice images!) is available on the ABC LD blog, 2016 summary. It seems that 2017 will be an even busier year for ABC LD. Our community members and the workshops planned for 2017 are indicated on the map below. Best wishes for 2017 to all! At UCL we’ve been pondering what a future learning environment might look like now for about two years. And we are starting to reach some conclusions. Our analysis of our VLE – and pretty much all of them out there – is that it suffers from two fundamental limitations. Silos – staff and students see the courses they are enrolled for, and generally can’t look over the fence to see something else. In real life, if a student asked to attend lectures for a course they weren’t registered for, we’d welcome their interest, their breadth, their love of learning. In the VLE we tell them that this is impossible. The VLE limits a student’s education to just what they have paid for, just what they deserve, and just what they need to know. All curiosity is lost. Control – the teacher sets things up and students do them. No questions asked or even allowed. Forums lay devoid of posts for fear of asking ‘dumb’ questions, or fear of making mistakes. Assignments are submitted with perfunctory duty with the best that a student can hope for getting a green pass on Turnitin and some feedback some weeks later which is ignored anyway as the triumph or the disappointment of the grade awarded is processed. All love of learning is lost. So we’re looking for something different. And our inspiration came from an interest place – Brockenhurst College in Hampshire. Now they have a very rural catchment area – some students travel over from the Isle of Wight to attend classes. So of course, they don’t travel if they don’t have classes and therefore feel disconnected from the university. We realised that part of the challenge at UCL is the same. The distances may be much smaller, but when you are travelling from home or commuting on the Central Line means that the disconnection is just as real. So we need an environment that promotes connections. It just so happens we also have the Connected Curriculum initiative which will encourage interdisciplinary research-based education, where students do real, authentic work, not just essays for a teacher to mark. Where group work is the norm, not the exception. Where students are not passive recipients, but actively engaged in enquiry. So it’s all coming together. 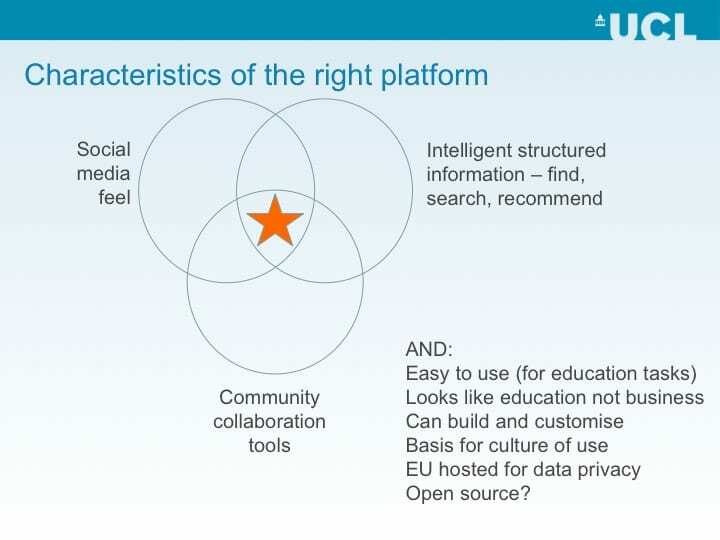 What we want for UCL is an Academic Social Network. What do I mean by that? Let’s take each word at a time. First, it’s Academic. That means it is designed for education. There are plenty of social networks around – Facebook, LinkedIn and Yammer spring to mind – but they are designed for different things, typically business. Whether it means allowing people to ask questions anonymously, embedding LaTex in messages so mathematicians can speak in their own language, or structuring data to be able to find final-year projects, the platform needs to speak to teachers and students as being something for them. It’s about work, but also all of the other things that happen at university; social clubs, sports, societies, volunteering. It’s a safe and trusted place to be because the user trusts the university and knows they are not the product to be sold and re-sold to the highest bidder. It’s Social. Because learning is social. I don’t just mean group work, but the full gamut of human social interaction. If you talk to students in our learning spaces, they are often working ‘alone, together’; that is they are doing individual tasks but just looking after each other. A student who is tired will be offered a coffee; someone will look after your laptop while you go to the toilet. Students are friends with each other on Facebook, but having staff friends is just ‘weird’. We want a space without complex meanings or difficult relationships but where everyone can connect with each other as part of the university community. Finally it’s a Network. Universities are big places, and UCL is bigger than most. Networks are a place where you can meet like-minded folk, but also get exposure and understanding of those who study different things, think in different ways, have different approaches to the same challenge. That network extends beyond current staff and students to pre-entry students, alumni, industry and charity partners – all of those that have a stake in the vibrancy and excitement of what a university can be. We’re going to get one. That’s quite a lot of work, as we have to do a lot of procurement activities to get what we want. But for now, we have students and teachers on the ground talking to peers, understanding needs, working our what it means to be part of the UCL community. We’ve done a lot of thinking, some talking and even more listening. It’s an experiment. We don’t know if it will work. Even if it does, it will probably take many years. It’s our shot at what a Next Generation Digital Learning Environment will look like. Many thanks to Eileen Kennedy for her work in developing and evaluating these ideas within UCL Digital Education. Cross-posted to the Connected Curriculum Fellows blog. My Connected Curriculum Fellowship project explores current practice with Connected Curriculum dimension 5 – ‘Students learn to produce outputs – assessments directed at an audience’. My emphasis is on assessing students’ digital (including digitised) multimodal outputs for an audience. What does ‘multimodal’ mean? Modes can be thought of as styles of communication – register and voice, for example – while media and be thought of as its fabric. In practice, though, the line between the two is quite blurry (Kress, 2012). This work will look at multimodal assessment from the following angles. What kinds of digital multimodal outputs are students producing at UCL, and using which media? The theoretic specificity of verbal media, such as essay or talk, explains its dominance in academia. Some multimodal forms, such as documentaries, are recognised as (potentially) academic, while others are straightforwardly authentic, such as curation students producing online exhibitions. At the margins are works which bring dilemmas about academic validity, such as fan fiction submitted for the From Codex To Kindle module, or the Internet Cultures student who blogged as a dog. How are students supported to conceptualise their audiences? DePalma and Alexander (2015) observe that students who are used to writing for one or two academic markers may struggle with the complex notions of audience called for by an expanded range of rhetorical resources. The 2016 Making History convenor has pointed out that students admitted to UCL on strength of their essays may find the transition to multimodal assessment unsettling and question its validity. I hope to explore tutor and student perspectives here with a focus on how the tasks are introduced to students. I will maintain awareness of the Liberating the Curriculum emphasis on diverse audiences. I will also explore matters of consent and intellectual property, and ask what happens to the outputs once the assessment is complete. What approaches are taken to assessing multimodal work? A 2006 survey (Anderson et al) reported several assessment challenges for markers, including separation of rhetorical from aesthetic effects, diversity of skills, technologies and interpretation, and balancing credit between effort and quality where the output may be unpolished. Adsanatham (2012) describes how his students generated more complex criteria than he could have alone, helping “enrich our ever-evolving understanding and learning of technology and literacies”. DePalma and Alexander (2015) discuss written commentaries or reflective pieces as companions to students’ multimodal submissions. Finding out about the practices of staff and students across UCL promises to illuminate possibilities, questions, contrasts and dilemmas. I plan to identify participants by drawing on my and colleagues’ networks, the Teaching and Learning Portal, and calls via appropriate channels. Building on previous work, I hope to collect screen-capture recordings, based on question prompts, in which students explain their work and tutors explain how they marked it. These kinds of recordings provide very rich data but, anticipating difficulties obtaining consent to publish these, I also plan to transcribe and analyse them using NVivo to produce a written report. I aim to produce a collection of examples of multimodal work, practical suggestions for managing the trickier areas of assessment, and ideas for supporting students in their activities. I will ask participants to validate these outputs. Would you like to get involved? Contact Mira Vogel. Adsanatham, C. 2012. Integrating Assessment and Instruction: Using Student-Generated Grading Criteria to Evaluate Multimodal Digital Projects. Computers and Composition 29(2): 152–174. Anderson, D., Atkins, A., Ball, C., et al. 2006. Integrating Multimodality into Composition Curricula: Survey Methodology and Results from a CCCC Research Grant. Composition Studies 34(2). http://www.uc.edu/journals/composition-studies/issues/archives/fall2006-34-2.html. DePalma, M.J., and Alexander, K.P. 2015. A Bag Full of Snakes: Negotiating the Challenges of Multimodal Composition. Computers and Composition 37: 182–200. Gunther, K. and Staffan Selander, S. 2012. Multimodal Design, Learning and Cultures of Recognition. The Internet and Higher Education 15(4): 265–268. Wikimedia UK held a Wikipedia Course Leaders event on the afternoon of July 19th. The meeting brought together academics who use Wikipedia in their modules, Wikipedians in Residence, and other Wikipedia and higher education enthusiasts (like me) to exchange their practice and think about some of the challenges of working for assessment in an environment which is very much alive and out in the world. As you can imagine, we were all in agreement about the potential of Wikipedia in our respective disciplines, which included Applied Human Geography, Psychology, Law, World Christianity, and Research Methods for Film. As you can see from the notes we took, we discussed colleagues’ and students’ reservations, tensions and intersections between Wikimedia and institutional agendas, relationships between students and other Wikipedians, assessment which is fair and well-supported, and Wikipedia tools for keeping track of students. There are plenty of ideas, solutions, and examples of good and interesting practice. There is a new and developing Wikimedia page for UK universities. If you are interested in using Wikipedia to give your students the experience of public writing on the Web and contributing within a global community of interest, there is plenty of support.